Place eggs in pan. Fill pan with cool water until it is about 1 inch above the eggs. Bring a rapid boil. Immediately cover and remove from heat. Sit covered for 12 minutes. Drain, cool under cold water. Slice into eighths. Whisk together the mayo, mustard, spices and capers. Toss with eggs. In a food processor or mini prep, pulse the spread ingredients until fairly smooth and the watercress is well incorporated. 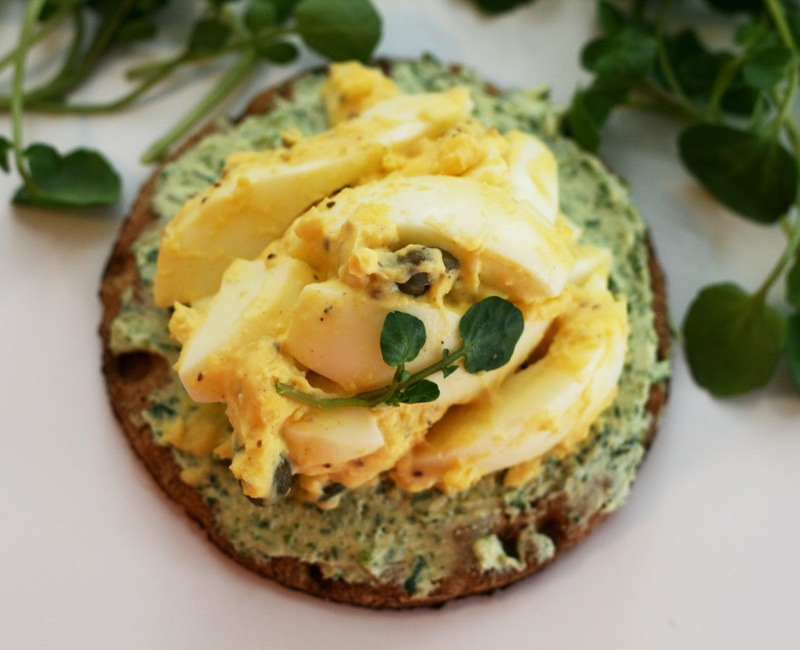 Spread on crisp bread, top with egg salad. I never really liked egg salad growing up which in retrospect is somewhat odd. I love deviled eggs and eggs in general (although I still don't really like eggs in potato salad; it is the stealth factor that gets me) but egg salad always left me cold. But in my quest to expand my culinary horizons I thought I'd try to make an egg salad I'd actually like. 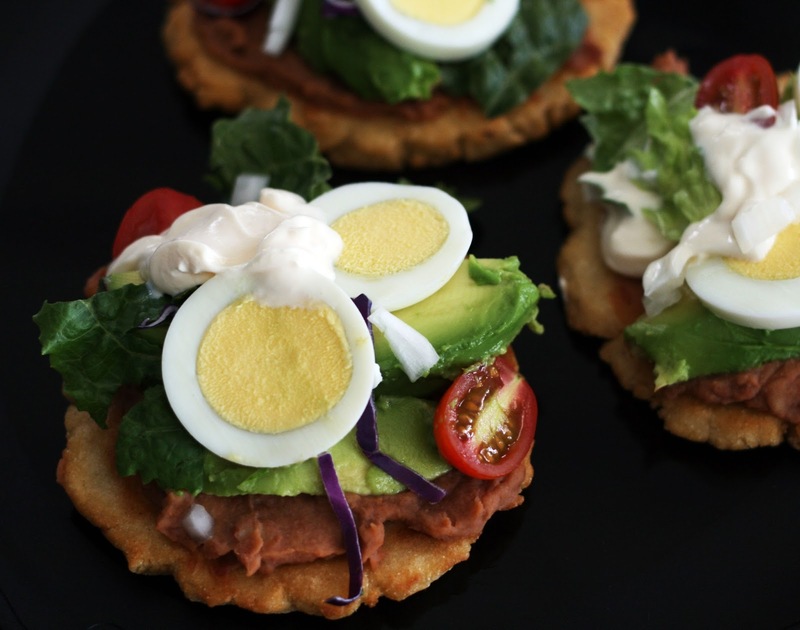 Taking a cue from foods I do like: deviled eggs, Cobb salad, tea sandwiches and Swedish style open-faced sandwiches I came up with this, which I loved and I think you'd like too. It isn't too mayonnaise-y and the eggs are slightly less than hard boiled so they are creamy rather than crumbly. Most of the "dressing" comes from the yolk, not the mayo, which is a pleasant change from the dare I say, drippy, egg salad I've had foisted upon me in the past. Melt butter over low heat in a large pot. Add marshmallows and stir until nearly completely melted. Removed from heat and stir in cereal and coconut. Quickly and carefully cover each egg in the coconut mixture and form into an egg shape. Roll or sprinkle with sprinkles. Cool completely. Wrap in plastic wrap or store in an air-tight container. Note: If you'd like to make more than four, make them in batches rather than doubling or tripling the recipe. I love Rice Krispies Treats and I love Cadbury Eggs so I am kicking myself for not thinking of a way to combine the two sooner. I made Rice Krispie Treats (with mint Oreos stirred in!) and noticed that although the marshmallow was certainly hot, the cereal made it cool enough to handle. Perfect for forming into shapes and as it turns out, folding over Cadbury eggs in the same way I fold sausage over real eggs to make Scotch eggs. 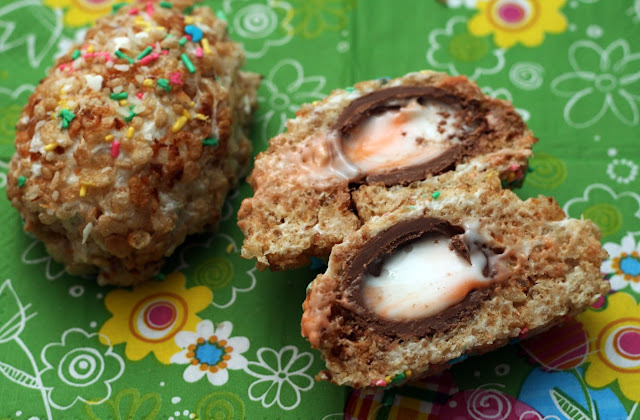 The trick is to work quickly and to roll the eggs in sprinkles when they are shaped to help keep any marshmallow that is peeking out from sticking to everything just as you would add breadcrumbs to a real Scotch egg. You could also just roll them in more Rice Krispies if you don't have sprinkles. I have more sprinkles than I know what to do with so I used them; plus they add a festive air. I added coconut for extra flavor (who doesn't like coconut at Easter or Passover time?) and to temper the sweetness a tiny bit. Of course, these are very sweet but it is a treat! Indulge! Preheat oven to 325. Line a jelly roll pan with parchment paper. Set aside. 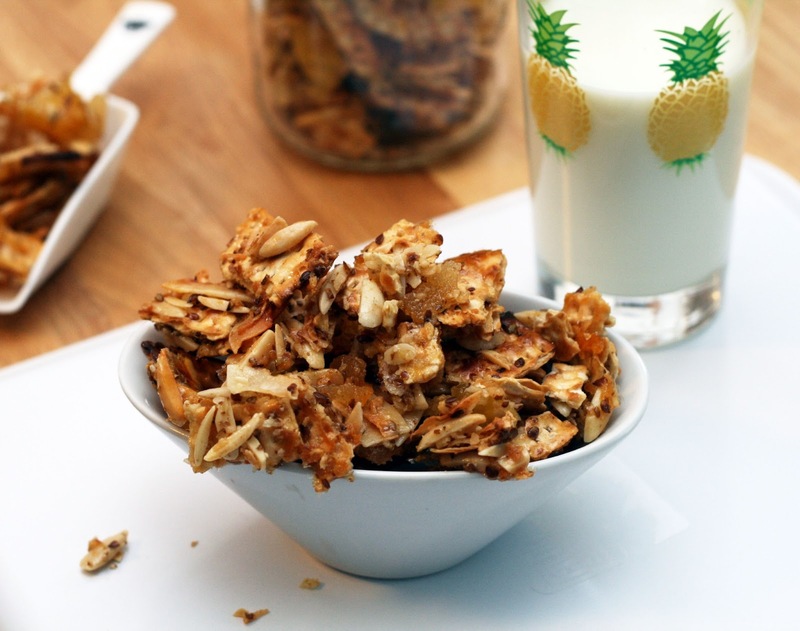 In a large bowl, toss together the matzo, flax seeds, almonds, coconut, pineappple and ginger. In a small bowl or measuring cup, whisk together the butter, syrup and spices until well combined. Drizzle 1/3 over the matzo mixture. Toss to coat. Continue to drizzle and toss until the matzo mixture is starting to stick together. You may end up with extra syrup at the end. Spread the mixture in a thin layer on the lined pan. Place the pan in the oven and bake 10-20 minutes, stirring occasionally until the the mixture is golden. Remove from the oven (it will be soft and sticky) and cool completely in the pan. Break into pieces if necessary and store in an airtight container. *If you can find matzo farfel (pre-broken matzo) you could use that. You would need roughly 3 cups. I just broke up my own matzo. I hadn't heard of matzo granola until I saw the contest to win a canister of it over on What Jew Want to Eat. I looked for it at a few of my local stores but when I couldn't find it, I thought I'd make my own. I'm not the biggest maple fan so I wasn't too disappointed*! Now I'd get to make it how I like it! Which means lots of that other Passover standby, coconut and his friend, pineapple. I threw in some flax so I could pretend it is healthier than it actually is and some almonds that had been hanging out in my freezer since I made this, this and this. The end result is a crunchy, sweet, tropical tasting bit of matzo paradise. Perfect to break up the monotony of Passover or any morning. 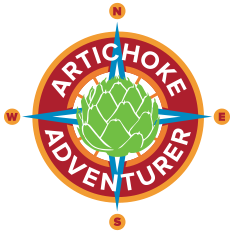 *I do love their slogan though: "The trail mix of the Exodus". In a small bowl, use a fork (or a mini chopper/food processor) and thoroughly mix together the yolks, mayonnaise, spices, and pimento cheese. Spoon an equal amount into each of the egg halves. Sprinkle with paprika. I love pimento cheese but I tend to make a big batch of it and end up eating it too frequently until it is finished. I'd hate for it to go to waste so I've been divising ways to use it in new and exciting ways. One of my favorites turned out to be in deviled eggs! The trick is to really mix the yolk and the other ingredients really thoroughly so they still end up creamy. No one likes a chunky deviled egg! 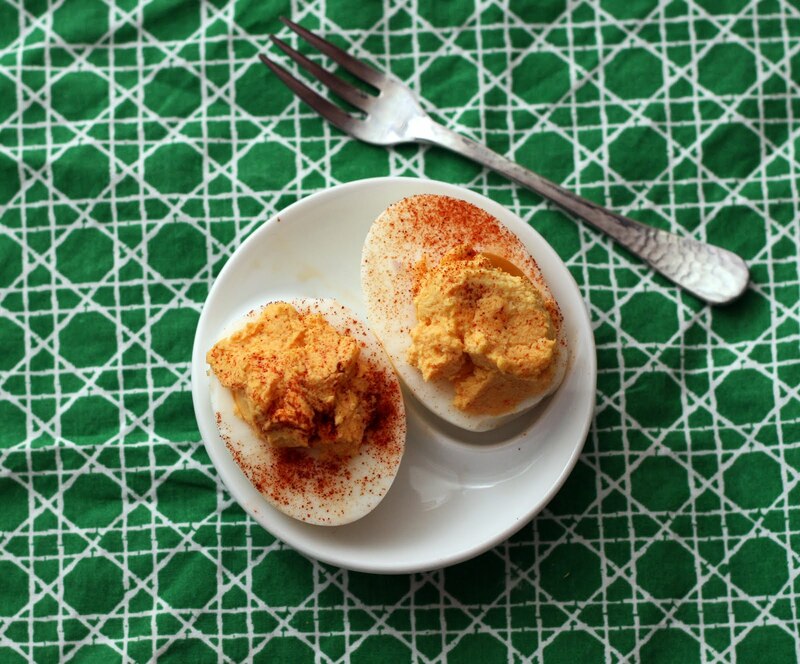 These eggs have a bit of a kick from the pimento cheese but look like regular deviled eggs. If serving at a party, I'd make sure they were labeled. Prep your waffle iron according to manufacturer instructions. Using a mixer, blend together the flour and baking powder and then add the milk, cream and seltzer until well combined. 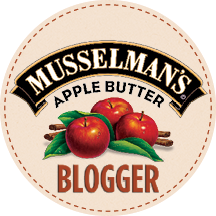 While the mixer is going, add the butter in a continuous stream. Mix until well combined. Ladle on to the waffle iron and cook until done. Serve hot with fresh whipped cream and jam. When we got married we didn't have a wedding but my in-laws did throw us a party about a month later and invited all their friends and relatives. We hadn't registered anywhere but were told to just in case someone wanted to get us a present. 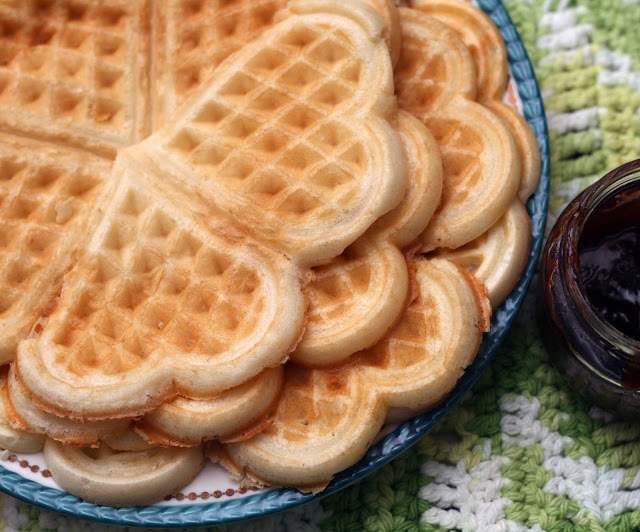 We put this Villaware waffle iron on the list because it made heart-shaped waffles (what better excuse than getting married to ask for such a thing?) and used it a number of times but the waffles it makes are rather thin and we ended up buying a Belgian-style waffle maker that we use most often. Most American recipes seem to make big, fluffy waffles and they just work better in the Belgian-style waffler. The heart-shaped waffle iron was super cute, well-made and made great waffles so I always felt bad not using it more often. Well, as part of the journey through exploring Swedish food I put myself on, I came to realize that my skinny-waffle-making waffler was very, very similar (if not the same!) as the waffle irons that make Scandinavian-style waffles. Then I read about Våffeldagen, Swedish waffle day and the story behind the waffle eating* and finally had my excuse to break out my waffle iron once again. I found a lot of references to using Vichy water or other sparkling water in Swedish pancakes and since we have a Soda Stream, I thought I'd give it a shot. It makes a thin, light batter, perfect for the thin, light waffles I was hoping for. They had the perfect crispy outside and moist interiors. One note: do not stack these to keep warm, the bottoms do tend to get soggy. Instead, stick them directly on the rack in a cool or very low (200) oven in a single layer until ready to eat. *Vårfrudagen or Annunciation is on March 25th. Vårfrudagen sounds like Våffeldagen when spoken aloud so it became a rather quirky tradition to eat waffles on this date each year in Sweden, home of many interesting food traditions. 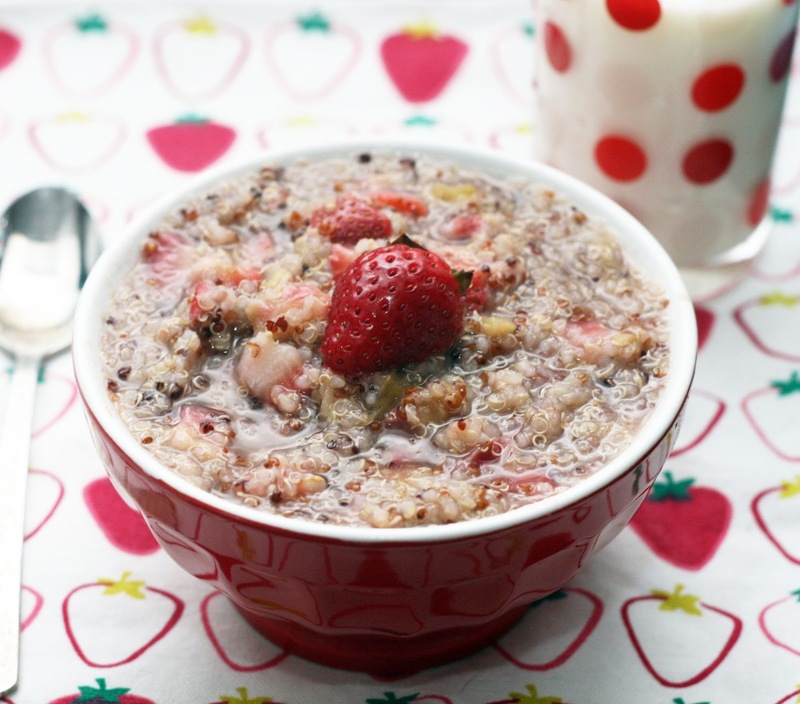 Place the quinoa, water and rhubarb in a small sauce pan. Simmer for 30 minutes, stirring occasionally. Stir in the strawberries and simmer for 5 additional minutes. Serve immediately. I'm always on the look out for new things to make for breakfast. Honestly, I'm not the biggest quinoa fan in most situation but when turned into a creamy, fruity porriage I can get on board. It is a fun change from oatmeal in the morning. Heat the butter and oil in a large skillet. Saute the onion, potatoes and carrots until the onion is translucent. Add the corned beef and spices. Saute until the corned beef is heated through. Plate and top with fried egg(s). When we were in Maine last year we had some truly delish corned beef hash at Hot Suppa in Portland. 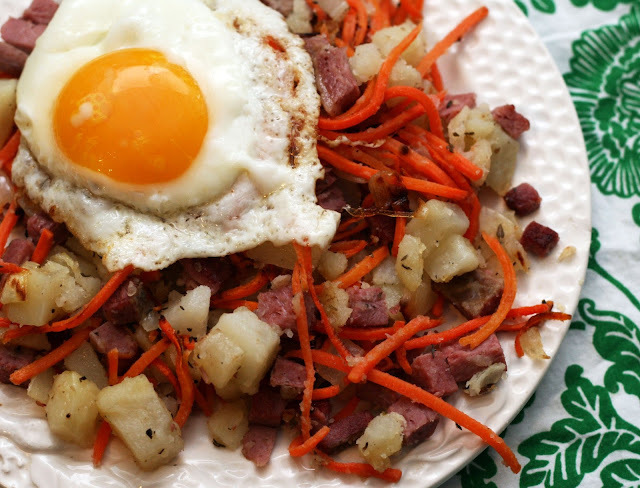 We didn't know corned beef hash could be so good. Or that it was such a popular dish in Maine. I've been itching to make my own version but didn't get to it until recently. Hot Suppa's hash had carrots in it which I'm not entirely sure is authentic, but we enjoyed it so I tossed them in this version as well. I also got the impression that their hash was sauteed and then made into large, rough patties since it held its shape more than the average hash and had a bit of a crust to it. You could do this (I think you'd have to refrigerate the mixture for a bit to make it "stick") but I don't think it is strictly necessary and skipping that step certainly puts hash on your table more quickly. I'm willing to bet they developed the patty method as a way of pre-making the hash to speed up things when someone orders it; avoiding starting from scratch with each order. This really isn't an issue if you are just making it for your family. Hot Suppa's hash featured shredded corned beef and if you have warm corned beef it is easier to shred but I was using leftover, cold corned beef so it cubed easily. Either way is tasty and gives you a bite of corned beef in every bite! Preheat the oven to 375. Butter and flour or spray with cooking spray with flour a 9-inch springform pan. In a medium bowl, whisk together 2 cups of flour, baking powder and salt. Set aside. In large mixing bowl, beat together the sugar, oil, egg and vanilla paste. Add the flour mixture alternately with the half and half, beginning and ending with flour until a thick dough forms. Pour batter into the prepared pan. Top with berries in a single layer. Set aside. In a small bowl, using a fork, mix together all of the streusel ingredients until a rough crumb forms. Sprinkle streusel evenly over the raw cake and berries. Bake about 50-60 minutes or until a toothpick inserted in the center comes out dry. Remove to a wire tack to cool. After about 15 minutes, release the cake from the pan and serve. I love streusel topping but I hardly ever make it because I always seem to forget to soften the butter for it, especially for recipes like this where there is no butter in the batter. So when Land O Lakes® approached me to create a recipe using their light butter with canola oil, I thought I'd see how it worked for streusel making. Since it is spreadable right out of the container, unlike butter, I didn't have to wait for it to warm up before using it. I think I broke my own personal record on getting a cake into the oven; even with the streusel, it took me less than 15 minutes to move from taking out raw ingredients to a cake in the oven. I wasn't sure how it would turn out but as you can see, the streusel was wonderfully crisp and buttery tasting, the perfect foil for the juicy berries. The cake itself was great too, very flavorful and moist but definitely a coffee cake, not just a plain cake with berries. 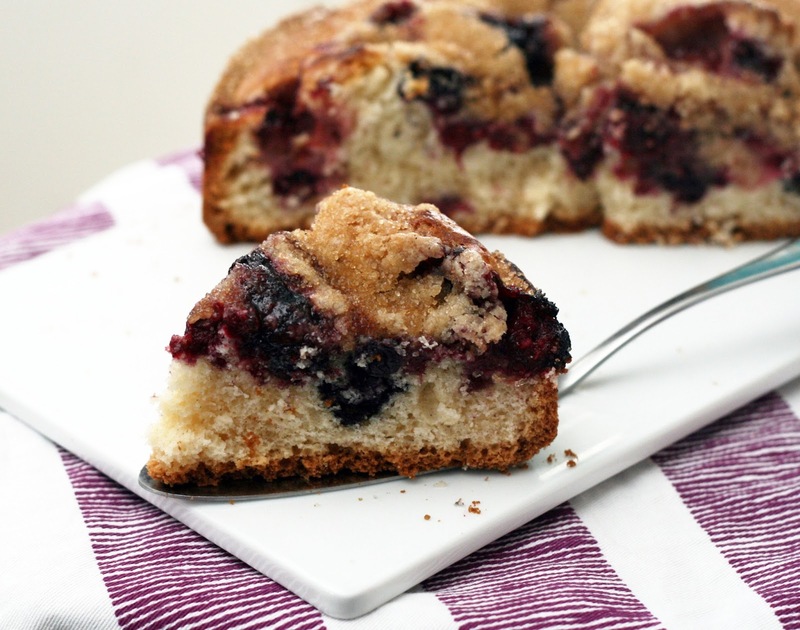 It has a fine crumb and firm texture that supports the berries and topping beautifully. Saute the onion and garlic in (Greek!) olive oil until the onion is translucent. Add the lamb and continue to saute until the lamb is fully cooked, breaking up any large pieces as it cooks. Drain off excess fat. Add the remaining sauce ingredients and simmer, stirring occasionally, until most of the liquid has evaporated. Set aside. Meanwhile, cook the pasta to slightly less than al dente. Allow to cool, then toss with the egg whites and cheese. Set aside. In a large saucepan, melt the butter for the béchamel. Whisk in the flour and when smooth, add the milk. Whisk to incorporate the flour mixture. Cook on low, whisking occasionally until thickened. Remove from heat. Whisk in remaining ingredients. Set aside. Pour half of the pasta into a 2 1/2 quart casserole. Top with half of the meat sauce. Press the mixture down firmly and make sure the sauce goes to each edge. Top with half of remaining pasta then all of the remaining sauce. Arrange the remaining pasta on top of the sauce and then top with the béchamel. Bake for 30-40 minutes or until the béchamel is golden. Loosely tent with foil and allow to sit 20-30 minutes prior to serving. 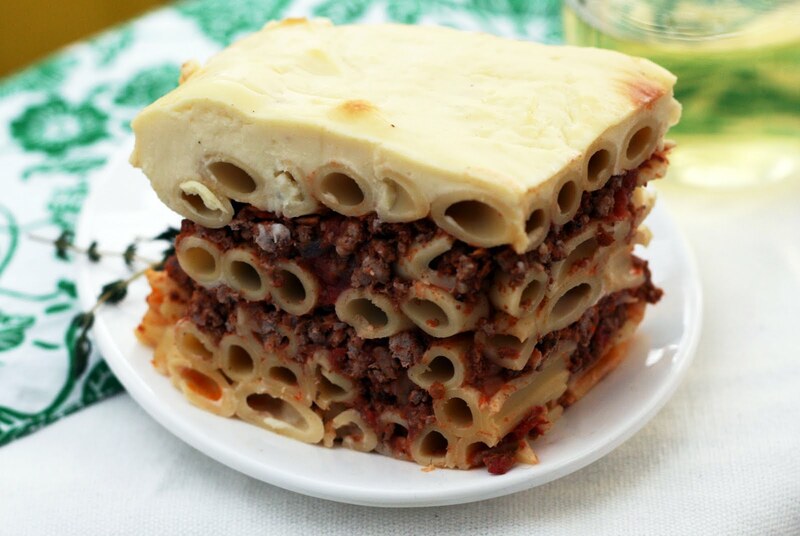 I've seen pastitsio described as "Greek lasagna" and it is sort of apt (although "Greek Baked Ziti" would be even more so) but does sort of downplay how tasty the dish on its own. It is a substantial dish, full of meat and cheese and eggs but oddly, the finished dish isn't terribly heavy. Not picnic food but not a "I need to take a nap after this" dish by any means. It is wonderfully savory with a rich sauce. I think it was even better the next day than it was fresh, a great trait if you need a make-ahead dinner option. There are a few steps but each is easy, I promise. Perfect for a weekend meal or special occasion. Place all ingredients in a 1 1/2 qt. saucepan. Cook over low heat, stirring occasionally, until the sugar dissolves and the mixture thickens, about 30 minutes. Allow to cool to room temperature. Using a fine metal sieve, strain the mixture into an air-tight, lidded container. Discard solids*. 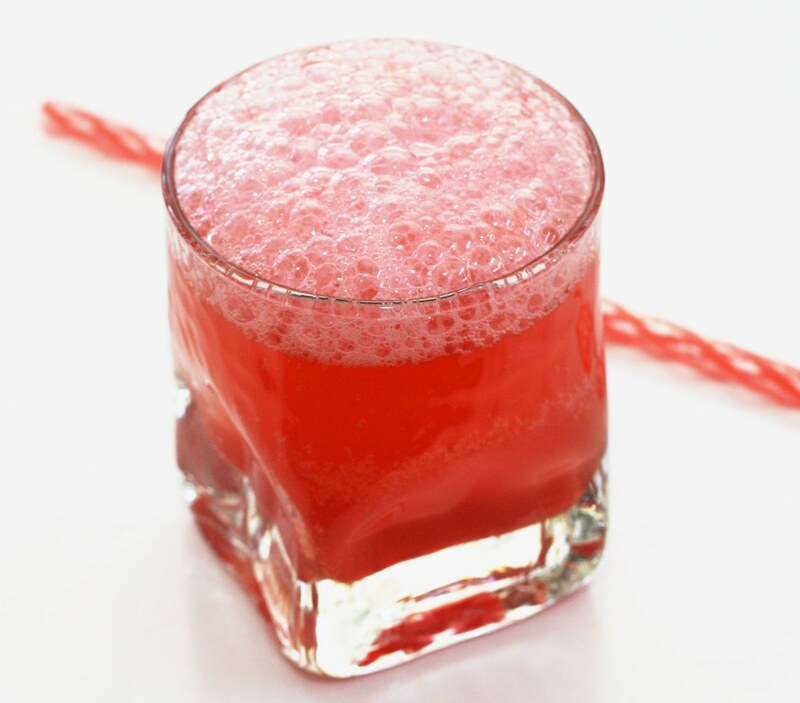 Stir 1 tablespoon into 8 oz of sparkling water per drink. Refrigerate leftover syrup up to 1 month. Yield: 1 cup syrup, enough for a dozen or more drinks. *Or eat them! It is basically candied rhubarb. I love going to the store and finding rhubarb again. It is always a sure sign of spring to come! Some years I've found it as early as January but some years due to rhubarb blight(! )I've had to wait until April which is disappointing, especially if you've been hired to create a new rhubarb recipe! Luckily for me, I've spotted these bright red stalks a couple of times already. I made rhubarb soda a long time ago and it was so good, I thought I'd revisit it with a new twist: mint! I seem to pair rhubarb most frequently with ginger (like my rhubarb ginger pulled pork and rhubarb yogurt muffins) but I think it goes well with mint as well. In fact my strawberry rhubarb mint jam was the inspiration for this soda. It is so refreshing and spring-like, it made me forget the snow we're being threatened with. Prepare the wraps according to package instructions. I heated mine for 15 seconds in a dry skillet. 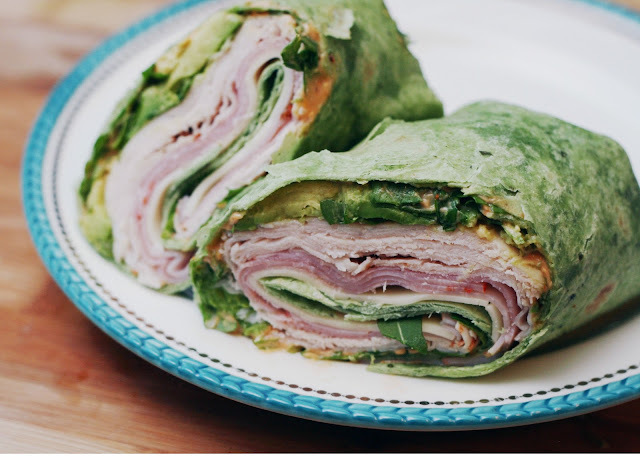 Spread a thin layer of chipotle mayo in the center of each wrap. Top with arugula. Mash 1/2 of an avocado onto each wrap over the arugula, spreading it out as evenly as possible. Top with a slice of cheese then a layer of turkey, then capicola. Fold the sides of the wrap towards the middle then roll the wrap from the bottom to the top, keeping the sides tucked in as you go. 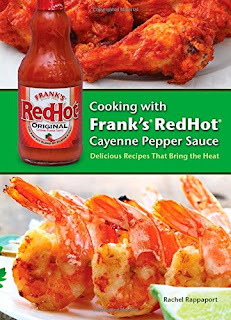 *I bought this at Baltimore's McCormick World of Flavors (Well worth a stop if you are in town, there is a huge selection of national and international McCormick products at price at or less than what I've found at the supermarket) but I've also seen it at regular grocery stores that have a good Mexican food section. Or make your own by folding come chopped chipotle in adobo in plain mayonnaise. As my husband works from home while recovering from his knee surgery, I find myself trying to make new and interesting things for lunch. Typically we eat leftovers or I fend for myself and Matt likes his rice cooker meals a lot so what to eat for lunch isn't much of an issue. Lately, however, I've been scrambling for lunches because not every dinner yields a leftover, we're both here and hungry, Matt hasn't been mobile to make his rice dishes and his doctors' appointments and physical therapy appointments have been taking up a quite a bit of time during the day. Last week I drove to our local Italian grocery after dropping him off at his appointment and picked up sandwiches to eat for that day (I knew we'd be too hungry to wait to make lunch by the time we got home) and ingredients to make wrap sandwiches for the next couple days when I knew we'd need lunch and a tiny bit more time. I already had some of the ingredients at home so I just picked up the provolone, my favorite capicola and what is quite possibly the best roasted turkey from the deli I've ever had. It is like actual slices of turkey, not that gross processed stuff and I swear it picks up extra deliciousness from being in the same deli fridge as all of these imported Italian goodies. I wasn't sure if these cuisine defying ingredients would all work (chipotle + avocado make sense but those two plus arugula + capicola?) but they really did. The wrap had that perfect balance of spice, creaminess and crispness that I feel so many wraps miss. It isn't a glamorous lunch but it is a very, very good one. Melt the butter in a medium sauce pan. Saute onions, celery, pepper and mushrooms in the butter until the mushrooms are softened and the onion is translucent. Add the flour and spices, stir to coat. Add the sherry and bring to a boil, stirring occasionally. Add the chicken, peas, stock and cream and simmer until thickened. Stir in parsley. Serve immediately over toast, rice or egg noodles. 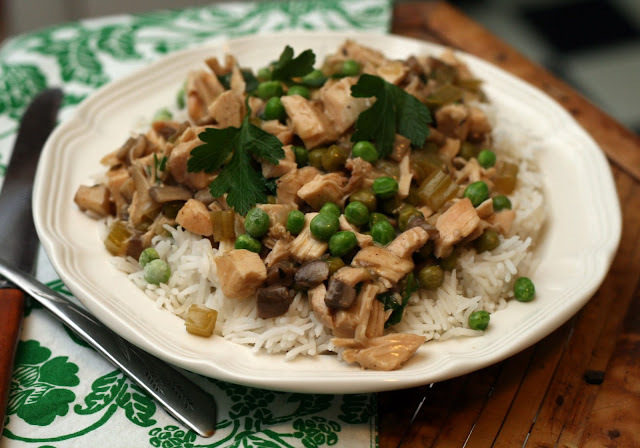 Chicken a la king is one of those recipes I don't think has really been fashionable since it was invented in the 1890s. Which is a bit of a shame because it really is tasty! I don't think I've ever seen it on a menu before and honestly, until I made this the other day, I think my only real exposure to it was a boil-in-the-bag meal when I was about 8. I hadn't thought of it in years until I came across a mention of it when I was planning our 1920s menus. I mentally filed it away for later. 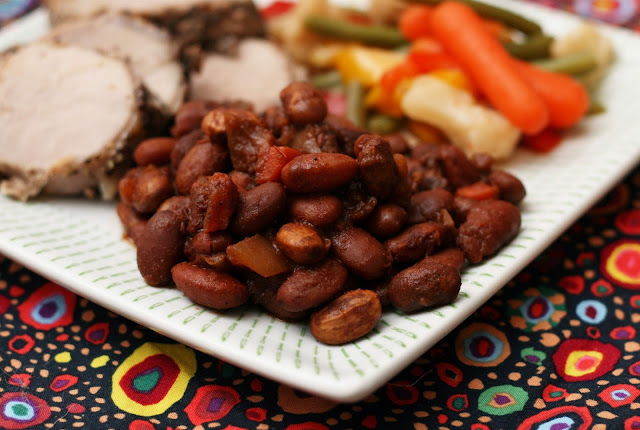 Matt's been home recovering from ACL surgery and this recipe was perfect for that. Easy to eat out of a bowl (since he can't eat at the table yet), could be made using store-bought rotisserie chicken (less work for me!) and quick to come together. It is rich tasting but this version isn't too heavy; there is just enough cream to thicken the sauce but the bulk of the liquid is much lighter chicken stock. I also added some vegetables which weren't strictly traditional but made it so the dish was more of a complete meal to itself to avoid making unnecessary side dishes.